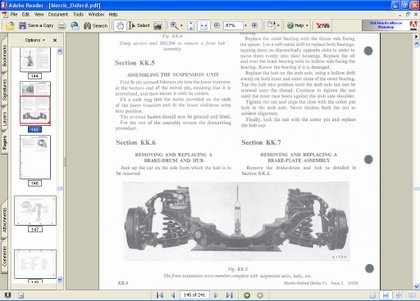 This is a truely amazing - a 45 year old workshop manual converted to electronic format, fully searchable, in crystal clear clarity on your PC. You can skip from chapter to chapter, search for words or phrases and even zoom in close to those tricky to read circuit diagrams. Find the section you want and print it out - scribble notes and get it as oily as you like - then throw it away when you're done! It came as 240 loose leaved A4 pages in a Morris ring binder, and is probably as comprehensive document as you'll find.